Painted swatch of Chrome orange. Chrome orange is a basic lead chromate which was introduce as a pigment in 1809. 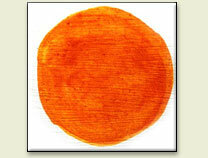 The color of the pigment can range from light to deep orange, the hiding power is excellent. The world production of chrome orange ceased few years ago. Now it is an obsolete pigment. Word origin: The name "Chrome orange" comes from The name of the chemical element from which comes the names chrome yellow and chrome orange, is derived from the Greek word "chrōma" (χρωμα), meaning color, because many of its compounds are intensely colored. It was discovered by Louis Nicolas Vauquelin in the mineral crocoite (lead chromate) in 1797. Crocoite was used as a pigment, and after the discovery that the mineral chromite also contains chromium this latter mineral was used to produce pigments as well. .
Pierre-Auguste Renoir, The Seine at Asnières (1875), The National Gallery London. This painting is an impressionist vision of suburban leisure, as two young women enjoy a lazy Summer's day on the river. The dazzling blue of the water in cobalt blue and the bright chrome orange of the boat also provided an opportunity for Renoir to test impressionist colour theory. They are opposites on the colour scale and create an intense contrast when put together. The pigments are applied almost unmixed, and the impact of the new pure orange is never more apparent, used in thick, pure strokes for the boat's outline. This is impressionism straight from the tube.